Its been such a long time since I heard a good Folk Metal band, and some crazy metal that was made especially for pirates. BARBAR'O'RHUM is a band that follows this genre, and does it in French. The band is releasing their very first demo that named after the band. The demo starts with a nice flute part that leads into "Coeur de l'Ocיan". The song starts really good, and shows some big potential, and there are great parts, and a killing guitar. But I think that the most important thing in the pirates songs is the fun, and these are the parts that makes you fly and sing non stop. However, I think that its missing here. Another thing was really missing in the song is some highlight point or some kind of a change part in the atmosphere. So it started good, but why keeping it the same as the start for all of the song? "Noire" is better than the first song. Its heavier and faster, but mostly a lot more interesting. I think that the most important thing is that the song is interesting. The thing that ruins a bit the song is the performance of the song. I am not saying that the band are not playing the song well, but its just feel really cold. We don’t feel that the band even like this song. And this is a great song, it should make me want to jump around with a good performance. The bottom line, we have to remember: this is a demo. Its not a bad demo, its not a great demo, its an opening line in this new band that is called BARBAR'O'RHUM. I can understand the idea what they want to do, and I also like it. I think that mostly this demo manged to show an idea of a band and to show a potential. Its not something that close to what the band wanted, but I think that if they will invest a lot more time in the writing process and in the attitude. But mostly, if this band want to do this kind of a music, they must remember that its all about the fun. 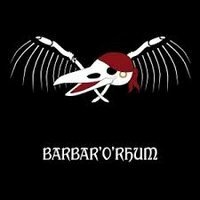 As ALESTORM making such a good time in doing this business, I think that BARBAR'O'RHUM can do it too.